Yesterday’s stats meeting was another brain melter. Two years I’ve been attending and I haven’t left a meeting yet feeling like there were no surprises left. Get ready: there is a lot of meat to chew through here. So, I have a TL;DR Version and a Full Edition. LET’S DO THIS THING. Lower Deer Valley condos are finally selling. Prospector and Kimball Junction condos are selling like crazy. Jordanelle is going gangbusters on condos, houses and vacant land. If you’re building a home, you’re probably buying land in Heber or Jordanelle. The PCMR/Canyons connection is potentially making Deer Valley more exclusive. 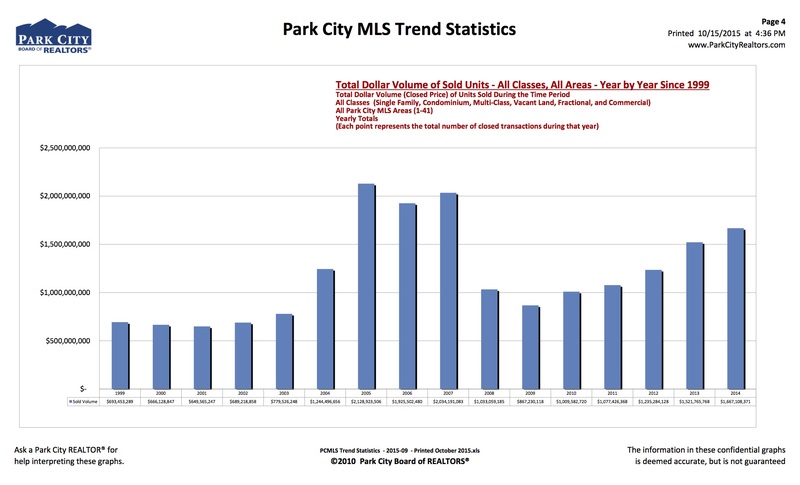 Median sales price for single family homes in the Park City limits is $1.439M, up 18% over last year; Snyderville Basin $874,500, up 20%; Heber Valley $354,900, up 3%; Kamas Valley $475,000, up 35%. 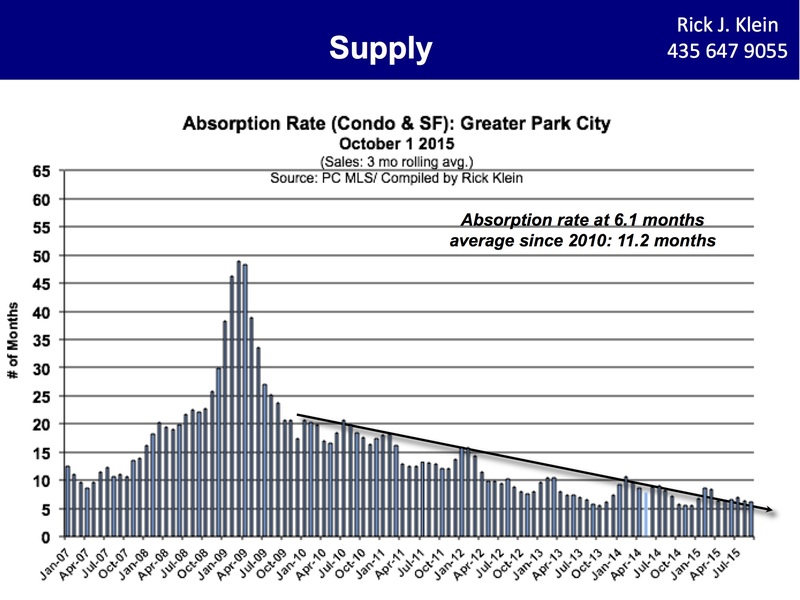 Greater Park City, median home prices are steadily increasing, but are in the same range as 2006, 2009 and 2010. Number of Units Sold overall in 2014 (2,332) is in the same range as 2003 (2,302) and 2008 (2,452). Total Dollar Volume Sold overall in 2014 ($1,667,108,371) is greater than each year since 2007, has been increasing steadily since 2009, but is still less than our peak in 2005 ($2,128,923,506). Median Price of Sold Units overall in 2014 ($425,900) is at the highest level since 2009 ($411,000) but still lower than our peak in 2007 ($540,000). 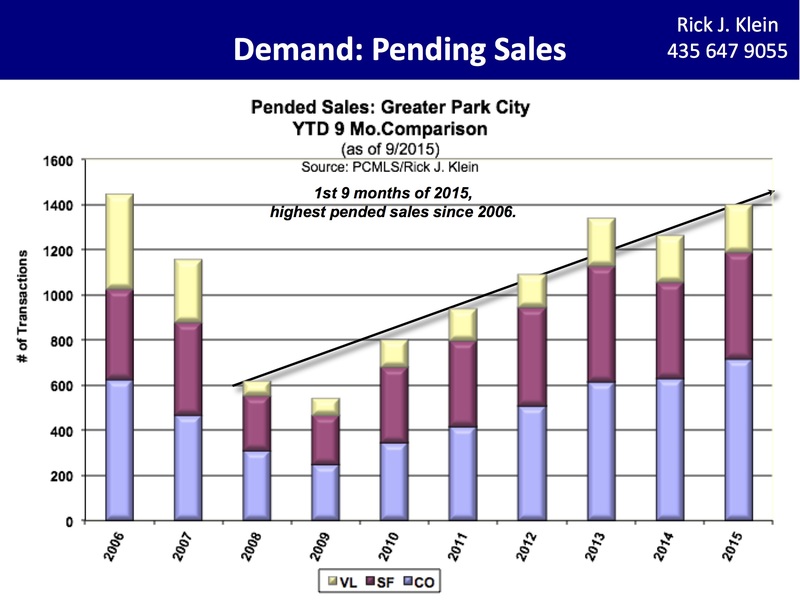 Pending Sales in Greater Park City for the first 9 months of 2015 are at the highest pended sales rate since 2006 and has been on a steady increase since 2009. 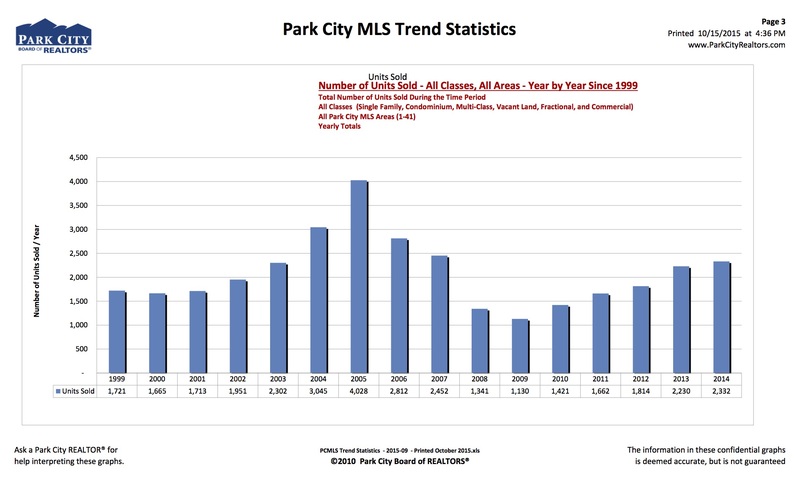 Closed sales in Greater Park City for the first 9 months of 2015 are at the highest rate since 2007, also on an increase since 2009. 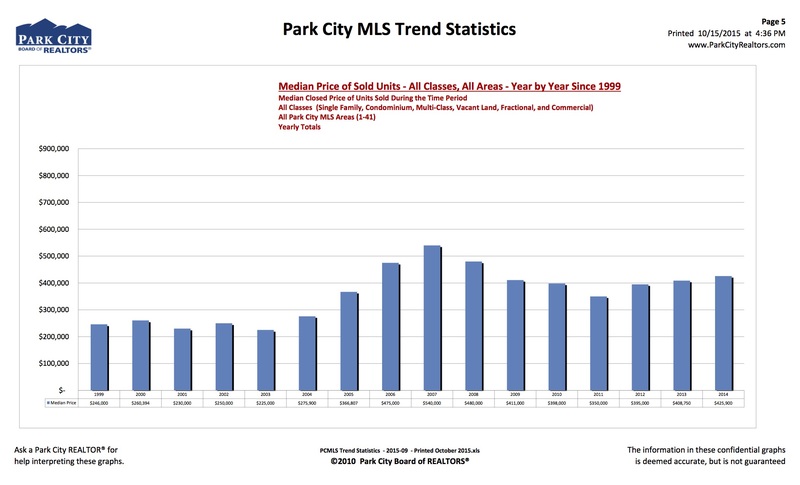 And as a whole in Greater Park City, median home prices are steadily increasing, but are in the same range as 2006, 2009 and 2010. 82% I MEAN COME ON FINALLY. New projects coming in Empire Pass, there may be some slowing in resale purchases until people see what the new products will be. Five of the 10 units at the new 820 Park Ave project are between $1.3M and 2.4M and may be closing this coming quarter. The penthouse at the Parkite project closed at the beginning of May at $3.5M, and the other 14 units are between $1.5M and $5.5M but not yet pended. 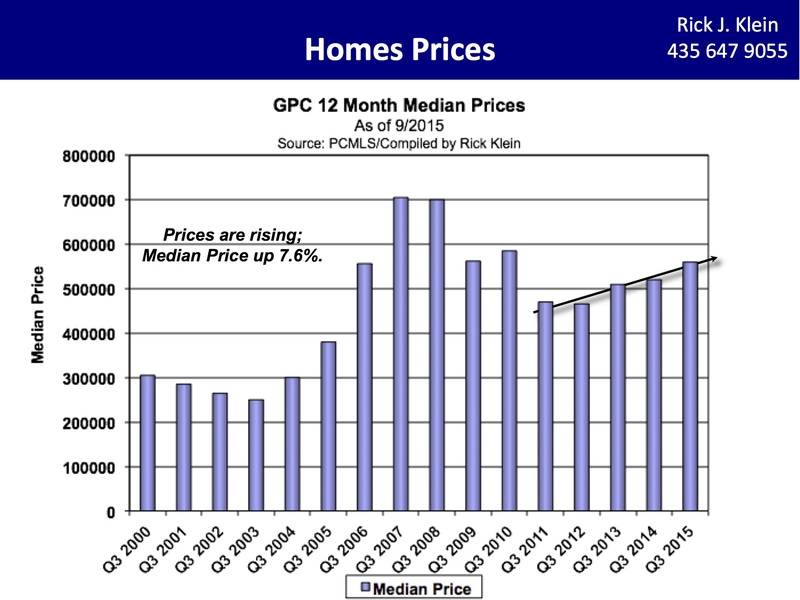 The average sold price will be affected already, but we will see how the 4th quarter shakes out for median pricing. New product coming on line here as well, Blackstone and Juniper Landing, both over $1M. What I am seeing in general is that it is less critical for buyers to have easy ski access. They are more willing to drive to skiing than I think they have ever been, and summer and year-round activity access is more important than ever. People are buying for a year-round lifestyle destination, not necessarily for a winter-only ski destination. All the stats are of note, but as I had 2 listings in Prospector this summer that sold in a matter of weeks, I was particularly interested to see what the numbers say there. This is a huge increase in quantity sold with a very small increase in price. The buyers of my listings were local to Park City or Salt Lake City, both bought with cash, both planned to use for some nightly rentals and some weekend use. This suggests a very interesting shift in attitudes. One other area of note is Jordanelle. Outside of the Park City School District, in between Heber City and Park City and on the Jordanelle Reservoir. This area has exploded in recent years with both condos and single family homes, and is rapidly becoming a great alternative to living in town for commuters to Park City or Salt Lake City. Now on face this isn’t terribly exciting, just lovely steady growth. 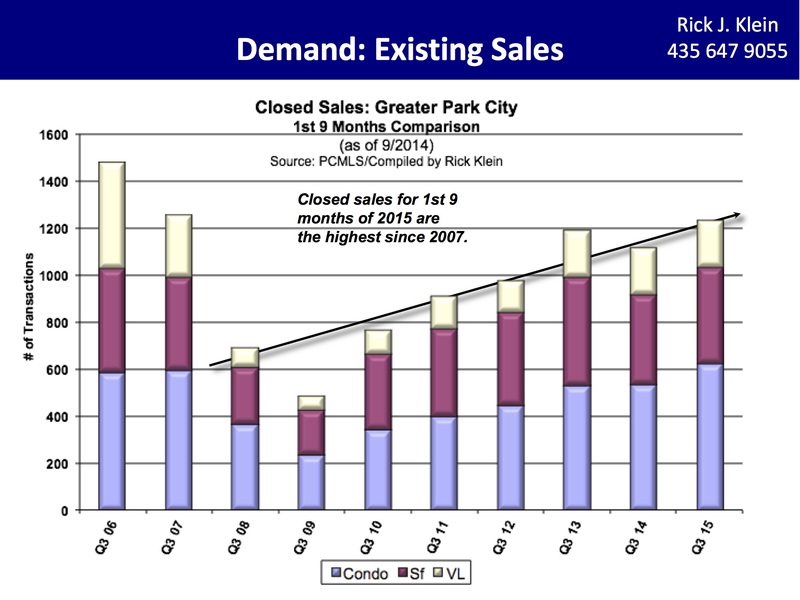 Oh but also 128 condos sold in 9 months equals 14 condos sold per month. ONE CONDO SOLD EVERY OTHER DAY THIS IS A BIG DEAL. It’s been my hunch that PCMR/Canyons combination would make Deer Valley properties more exclusive and the merger would make for a more clear division between enthusiasts for either resort. What I’m seeing here in Deer Valley and Canyons (which includes the Colony) numbers is fascinating and backs my claim. I would’ve expected much greater interest in Canyons luxury properties if all the hype is true. What I’m seeing is that even though prices are slightly less at Canyons buyers are opting for a purchase in Deer Crest which is the ski-in/ski-out community and Deer Valley. Though going from 4 to 7 is a small sample size it’s still a significant jump. At Jordanelle again, very exciting growth in single family homes. I will be shocked if prices do not increase in the 4th quarter at Jordanelle. This is a lot of new product coming on line and closing, and to double the quantity sold year over year is just begging for a price increase. The other areas that are important to watch are communities in Wasatch County. These counties are critical competitors for Park City property, and offer more for the money and a different commuting route for those headed to Salt Lake City. Another interesting report is what’s coming out of Timberlakes. Timberlakes is formerly a summer cabin community outside of Heber City, above Red Ledges Golf Course. Originally with only dirt roads, the community has attracted enough single-family residents that the infrastructure is building up around them. Now there is a manned guard house and a gate, as well as paved roads and regular snowplowing. What I find most interesting about this is that, while there were quite a few lots sold in Timberlakes, they pale in comparison to those sold in Heber. This may indicate that the buyer in Timberlakes is looking for something more affordable and already built; easier to get a loan on than buying a lot and qualifying for a construction loan. Time will tell. TA DAH. You made it! Except that there will be more to dig through and tons of great information in the three reports I posted above, and when the Board releases their press release we’ll have even more to think about. But other than that, we’ve arrived. Let me know if you have any questions about specific neighborhoods, etc. and we’ll pore over the details.